The waters around Whyalla are famous for their fishing, especially the Red Snapper. 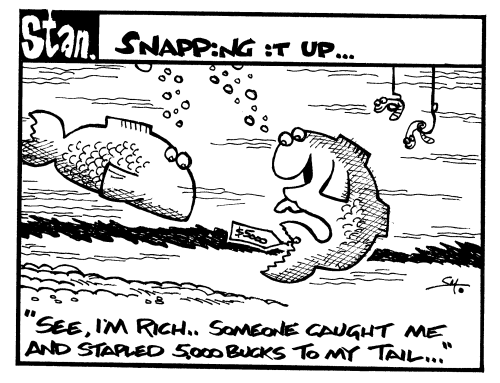 Each Easter a fishing competition is organized which brings in anglers and their boats from all around Australia, although each year I seem to have some cartoon which takes the side of the much fished fishes. There have been several changes to the fishing competition over time. At one point it was thought a good idea to ‘tag’ certain fish, and a catch and return policy was discussed, as it would be something of a disaster if all the fish were caught.